This was a course project for "CS 7180: Behavioral Modeling and Decision-Making in AI." 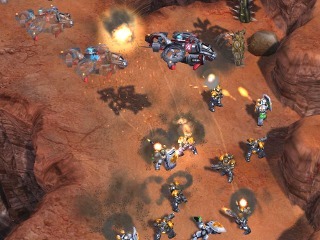 Real-time strategy (RTS) games require artificial intelligence (AI), especially in the design of computerized opponents. Because of the computational complexity involved in managing all aspects of the game, many AI opponents are designed to optimize only a few areas of play, such as economic efficiency. The aim of this project was to help address the need for AI combat strategies that were not computationally intensive. Our goal was to produce a computationally efficient model that was accurate at predicting the results of complex battles between diverse armies, including which army would win and how many units would remain. Our team of three students designed four stochastic models of combat with varying levels of complexity. We implemented these models within a prediction framework that was able to quickly run thousands of simulations and output the estimated likelihood of each army's victory, as well as the expected composition of remaining units. We designed and ran numerous experiments on custom maps to test the effectiveness of our models and begin outlining the contour of an "Accuracy vs. Computational Complexity" graph. Our results suggested that a relatively simple approximation model of combat could accurately predict many battles that did not involve heavy micromanagement or spell-casting units.